MAVEN launched on November 18, 2013 (watch video of launch), and entered the orbit of Mars on September 21, 2014. The first fuel burn inserted the spacecraft into a capture orbit with a period of 35 hours (the time it will take to make one complete orbit around Mars) and an altitude of approximately 380 kilometers. Shortly after Mars orbit insertion, a second fuel burn placed the spacecraft into its 4.5-hour period requirement for acquiring data. Three smaller burns reduced the periapsis altitude (closest distance) of the spacecraft to approximately 150 kilometers, placing MAVEN within the required corridor and a 75° inclination elliptical science mapping orbit. MAVEN measurements are being taken from this elliptical orbit over a period of one Earth year, with five 5-day “deep dips” interspersed to sample the entire upper atmosphere. For additional information about MAVEN’s science orbit, please see: http://lasp.colorado.edu/home/maven/science/science-orbit/. This schedule provides thorough coverage of solar conditions, local time, latitude, and crustal magnetic configuration, and ensures that we obtain the measurements necessary to achieve all science objectives. Goddard Space Flight Center (GSFC) managed the mission design and is leading navigation for the MAVEN spacecraft. Operational navigation is being led by the Jet Propulsion Laboratory (JPL). UPDATE: In light of its continued scientific success, the MAVEN mission was extended from November 2015 through September 2016. 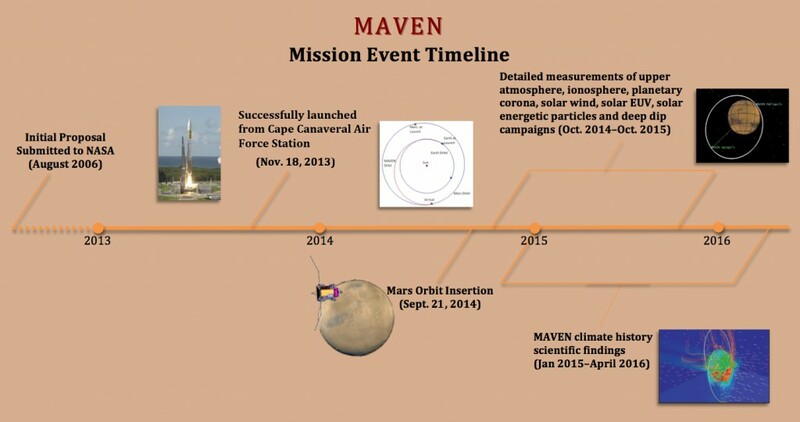 This will bring the MAVEN mission cycle in synch with the wider planetary mission review process, planned in 2016, that will determine future mission extensions.